They provide ground-breaking training programmes for thousands of young Omanis which inspires a new generation to discover and enjoy sailing. For many, as a recreation which combines physical exercise with mental stimulation and teamwork – and for some, as a competitive sport at the very highest levels. Muscat, March 24th 2019: An Oman Special Olympics sailing team is celebrating gold medal success at the Middle East’s first ever World Games event in Abu Dhabi. 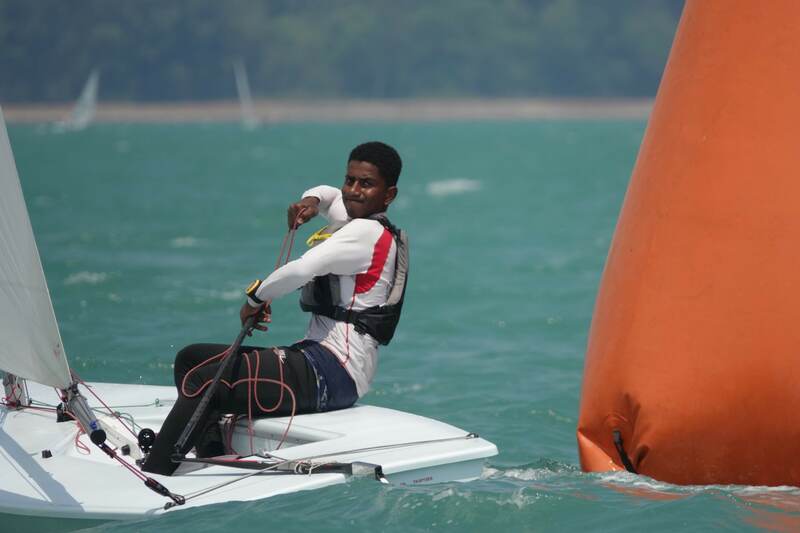 Mohamed Ahmed Al Wahaibi won his class in the Laser Radial event at the high-profile international games which attracted 7,500 athletes from no fewer than 190 countries. The 24 year-old gold medal winner was part of a six-strong Omani sailing team supported by instructors from Oman Sail schools and coaches. A full-time employee at Oman International Group SAOC, Mohammed began sailing in Oman Sail Al Mouj Sailing School on October 2018. “Mohamed is a strong guy and he has worked hard and trained hard for over a year to get the medal – we are going to continue working with him and his college and develop his abilities,” said the Oman team’s leader Ali Al Shuhaimi. 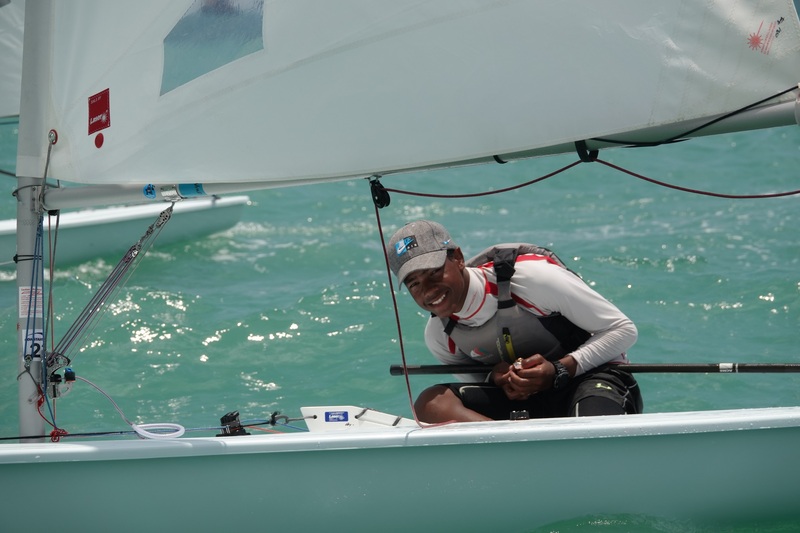 Also racing in the single-person Laser Radial class were Sufuat Ahmed Al Kharusi, 25, and Muhana Salim Al Manji, 22, who finished in fourth and fifth place respectively. The youngest member of the Omani team was 17 year-old Abdullah Saleh Al Ruqaishi, who raced in the two-person Bahia class accompanied by sailing instructor Saleh Al Raisi from Muscat’s Marina Bandar Al Rowdha Sailing School. Also in the Bahia fleet were Mahmood Hamood Al Hasni, 25, and Samir Sulaiman Al Harthi, 19, who raced with Al Mouj school instructors Abdullaziz Al Sabahi and Ghassan Al Zadjali. “The Special Olympics World Games is a good start and all the team did a good job – when we get back to Oman we will develop a clear plan for the future,” Al Shuhaimi, who also worked as Assistant Technical Director Delegate during the sailing event. “I need to thank everyone who has been part of this project, and also the organisers of the games. “For the Bahia sailors it was their first time, but it was a great experience and we can work more with them,” he added. Overall, Oman sent 93 athletes to the Games who competed across 14 sports and winning no fewer than 47 medals, 12 of them Gold. Oman Sail played an active role in the Games, with Ahmed Al Qasmi, Nawaf Al Ghadani, Sameer Al Battashi and Faisal Al Qaitaiti being part of the race management, and Ali Ambousaidi from Oman Sail’s Corporate and Personal Development department as a member of the Game’s jury. The post holder will deliver PADI Dive Courses in line with the PADI Course requirements. They will also be responsible for guiding certified divers on trips. This includes the preparation of the dive equipment, safety briefings and ensuring a high level of customer engagement at all times. • Actively sell Oman dive products, whilst on and off the water. • Jointly responsible for the safety and welfare of all dive guests when on the water. End to end responsibility for running the SeaOman Diving operation. This includes instilling excellent customer service, and creating an efficient work environment, managing a team of dive instructors, guides and boat captains, maintaining equipment and boats, and overseeing the administration of a growing business. They would work closely with the other commercial areas of Oman Sail but must primarily drive sales and maximize revenues for the dive centres, as well as providing a safe and professional dive operation across multiple centres. create and deliver a 3 years business plan and take responsibility for overall dive revenue streams and budgets. • Ensure all centres have SOPs that are in line with PADI. The jobholder oversees all marketing activities of the company ensuring that the marketing function effectively supports and delivers on Oman Sail’s business and commercial objectives. • Create, deliver and continually update a marketing plan and strategy for Oman Sail’s events, sponsorship obligations and commercial services to ensure that objectives and targets are met. • Execute the company marketing strategies in line with resource, budget and business objectives. The job holder will play a key role in developing brand awareness by representing Oman Sail’s events and media activities in Oman and abroa. Muscat, March 11th 2019: Two young Omani sailors have made history by both winning medals at the high-profile Asian Laser Championship in Singapore. Laser 4.7 racers Abdulmalik Al Hinai and Al Moatasem Al Farsi each delivered multi-race winning performances at the international regatta on their way to taking silver and bronze medals respectively in what is Oman Sail’s most successful regatta to date at this level. In fact Al Hinai came within an ace of winning gold at the regional championship, finishing on the same points as overall winner Jonathan Lio from Singapore, and only losing the top spot on the countback scoring system used to resolve tied results. Al Hinai won three races and posted podium finishes in six others in the 14-race event, while Al Farsi was also victorious in three races on his way to third place overall. “This is a big day for Abdulmalik, Al Moatasem, Oman Sail and the country as a whole,” said Rashid Al Kindi, Oman Sail’s national team manager and chairman of the Oman Sailing Committee. Both youngsters achieved their success racing against talented and competitive sailors from countries including Thailand, China and Hong Kong at Singapore’s National Sailing Centre from March 2-9, and proudly displayed Oman’s national flag on the podium at the prize-giving ceremony. They were welcomed back home at Muscat International Airport by their parents, coaches and sailing school managers. Mohsin Al Busaidi, who was on-site during the event as Oman Sail’s Youth Programme Manager, said: “We are delighted to be able to celebrate Abdulmalik and Al Moatasem’s success, they both thoroughly deserve it after all the hard work they have put in. The post holder is responsible for providing Cash Management, financial, clerical and administrative services to support the Finance Manager in ensuring effective, efficient, timely and accurate provision of information and reports under his or her control financial and administrative operations. • Assist in accurate processing, recording and filing of all financial transactions. • Verification and posting employee related claims, advanced etc. • Carry out any other ad hoc tasks as assigned. The post holder is to assist with the logistics and operations of the International Race Team and Offshore Sailing Squad and serve as liaison between teams and the project manager to ensure a smooth flow of activities. • Ensures maintenance of up to date country and plant shipping instructions by mode of transportation. • Negotiates agreements with local carriers, forwarding and customs agents. • Leads the coordination effort with the projects managers in preparation of goods for shipping. • Ensures proper packing, marking, labeling, weight and dimensions of cargo. • Ensures compliance with shipping instructions to final destination; supervises and creates documentation required to ship goods to end destination as per shipping instructions. • Obtains import and export permits and licenses; whenever necessary. • Responsible for the accurate completion of the Shippers’ Dangerous Goods Declaration form for hazardous cargo. • Ensures compliance of the logistics organization with policies, procedures and local laws, and global logistics guidelines. • Maintaining financial records for the department and assisting Director with collating the detailed monthly spend of diverse teams. • Conduct regular performance reviews and appraisal of new and existing suppliers, contractors, agents and service-providers to assess their performance. • Taking a lead role in liaison with the Offshore Sailing Squad. • Managing logistics for the Offshore Sailing Squad: Travel, Visas. • Working with the Logistics Manager and Director of Operations on all logistical and operational activities as required and instructed. • Covering for any other member of the logistics team as and when required. • Assisting at a number of Oman Sail Events through the year undertaking roles as explained in advance by the relevant Event Manager. 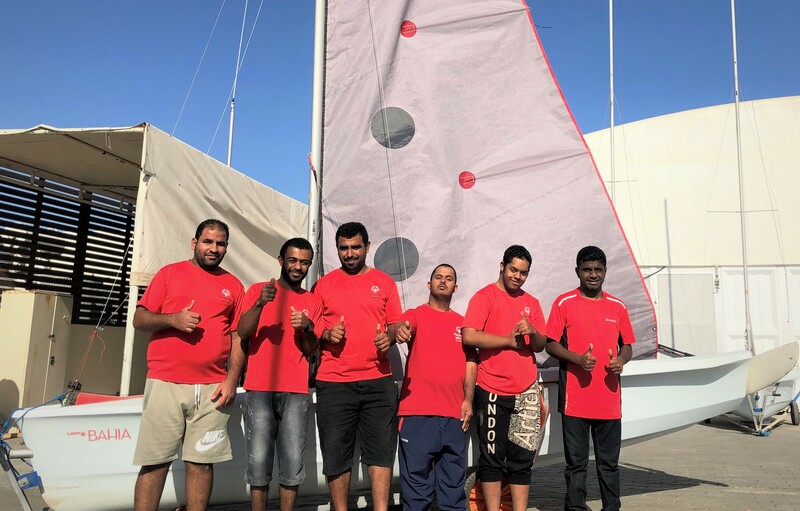 Muscat, February 24th 2019: An Oman Sail team is making final preparations before heading to the first Special Olympics World Games ever held in the Middle East. The six-strong Omani team will be among more than 7,500 athletes from no fewer than 176 countries who will gather in Abu Dhabi for the start of the Games on March 14th. Sailing is one of 24 individual and team sports represented at the two-week event, earning its place as an accessible sport that can accommodate disabled athletes of all backgrounds and abilities. Oman is supporting the Games by providing 12 two-person Bahia boats. The youngest member of the Omani team is 17 year-old Abdullah Saleh Al Ruqaishi, who will be racing in the two-person Bahia class with sailing instructor Saleh Al Raisi from Muscat’s Marina Bandar Al Rowdha. Joining him in the Bahia fleet are Mahmood Hamood Al Hasni, aged 25, and Samir Sulaiman Al Harthi, 19, who will sail with Al Mouj instructors Abdullaziz Al Sabahi and Ghassan Gulam Khuda Bakhsh Al Zadjali respectively. All three pairs will benefit from coaching by Mohammed Al Battashi, who is also from Oman Sail’s Al Mouj sailing school. In the single-person Laser Radial class Sufuat Ahmed Al Kharusi, 25, is racing alongside teammates Mohamed Ahmed Al Wahaibi, 24, and Muhana Salim Al Manji, 22, all under the watchful eye of Laser coach Ahmed Al Wahaibi. 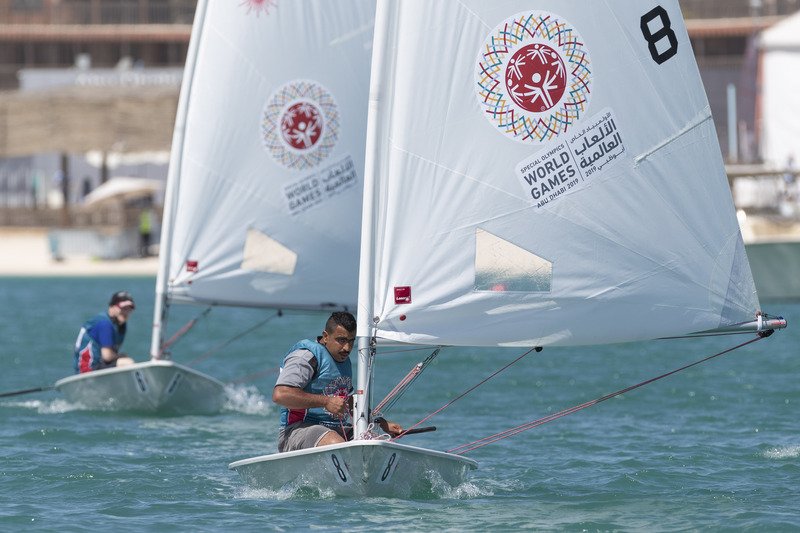 “We are hoping for good mid-fleet performances in both classes,” said Al Shuhaimi, and we have targeted fifth place finishes from one of our sailors in each one.” Also playing an active part in the Special Olympics World Games are Ahmed Al Qasmi, Nawaf Al Ghadani, Sameer Al Battashi and Faisal Al Qaitaiti, who will be part of the race management team. In addition, Ali Ambousaidi from Oman Sail’s Corporate and Personal Development department will be of the Game’s jury. The Special Olympics World Games will run in Abu Dhabi until March 21st. The sailing event will be held at the Abu Dhabi Sailing and Yacht Club. Established in 2008, Oman Sail is a national initiative that uses the power of sport to contribute to the development of Oman. The equal opportunity project runs sailing programmes for hundreds of young Omani men and women, inspiring a new generation to discover sailing. It encompasses a national sailing squad and high achieving inshore and offshore racing teams, all of which benefit from world-class coaching.